Radiologist Annette J. Johnson, MD, MS, recognized early in her training that there was room for improvement in the communication process between radiologists and referring physicians. Whether reporting or consulting, there was often an information gap, which could lead to errors or missed diagnoses. She thought the issue would be addressed by the time she was practicing her specialty. As she began her faculty years, however, the professor and vice chair of quality and patient experience in the radiology department at Wake Forest Baptist Medical Center continued to see issues with communication among specialists. "I was always most concerned about patient care, but I started viewing care from a lens that was completely focused on imaging," Johnson says. "I guess you could say that I viewed the world of patient care through 'radiology-colored glasses.'" Johnson and others in her field are now rethinking their approach to patient care, taking the lead in creating a team perspective to the diagnosis and treatment of injuries and disease. Whether it's as part of a tumor board or as a participant in a virtual consultation, radiologists are finding ways to interact more effectively with referring physicians. Tools for that task include critical test result management, selective word choice in radiology reports, multimedia reporting, and technology that can assist in the assimilation of all specialties involved in a patient's care. "Radiologists need to practice patient-centered medicine, not radiologist centered," says Tarik K. Alkasab, MD, PhD, service chief for informatics/IT and operations and an emergency department radiologist at Massachusetts General Hospital. "And radiologists need to take ownership of this." A team-based focus on patient care can help reduce breakdowns in the diagnostic process. Communication gaps can lead to failure to order the appropriate test or failure to create an appropriate follow-up plan. Questions remain regarding where radiologists fit in with the overall clinical care team and how they should ensure that patients ultimately receive benefit from what they report. Johnson's passion for working to improve communications between radiologists and referring physicians was triggered by a case involving an active, healthy 70-year-old woman who arrived in the emergency department with multiple fractures and a subdural hematoma after a fall. As part of the patient's workup, she received multiple CT scans, one of which showed a 7-mm incidental lung nodule. The radiologist reported the nodule and recommended follow-up per the Fleischner guidelines for the management of solid pulmonary nodules. The patient was treated for her injuries, which included a subdural hemorrhage, spent time in the neuro ICU, and had a full recovery. After she was discharged from the hospital, however, information about her lung nodule never made it to her primary care physician. She returned to the hospital several years later with a diagnosis of stage 4 lung cancer. "It was truly heartbreaking," Johnson says. "I cannot imagine what it was like for the woman and her family. For those of us at the hospital, it was horrible. To know we had had the opportunity to intervene and prevent this advanced disease and grim prognosis—and that despite good intentions, we had failed as a system to help her—was horrible. It flies in the face of the very reason we have chosen to be health care providers." Part of bridging any communication gaps in the patient care process is determining where radiologists fit in the diagnosis and treatment process. "As radiologists, our input is crucial for many care processes," Johnson says. "We touch nearly every other service line in the health care system. However, we are often not at the table to help design best-care pathways, and the quality and efficiency of patient care suffers as a result." Johnson sees big challenges in addressing the communication gaps between radiologists and referring physicians. There's the physical separation, facilitated by PACS; hectic work schedules; and navigating large practice groups, where radiologists may not know all of their referrers and vice versa. "I also think workflows on both sides have created even fewer opportunities for key, timely conversations about individual imaging scan results," she says. One way of bringing the medical minds together for a unified patient care plan is to create multidisciplinary, interprofessional teams to share reports and analyses on different tests and studies that are used in the diagnosis and treatment of patients. For incidental lung nodule issues, Wake Forest formed a group, which includes patient advisers, to look at how they can best make sure no nodule that needs follow-up gets unintentionally overlooked or ignored. "The input of a broad spectrum of stakeholders has been invaluable in coming up with a plan that has a good chance of success," Johnson says. Radiologists at New York University (NYU) Langone Health have joined forces with referring physicians by establishing embedded reading rooms in their clinics. Andrew B. Rosenkrantz, MD, abdominal imaging section chief at NYU, says this approach brings radiologists and referring physicians together in a collaborative fashion, where they can share more than reports and findings. Their goal is to reduce errors and communication issues as well as improve referring physicians' understanding of radiologists' findings. "Sometimes the referring physician will bring patients into the embedded reading room to review the images directly with the radiologist," Rosenkrantz says. "The radiologist/patient interaction can be more compelling, once patients have this collaborative experience." In general, Rosenkrantz says that radiologists have worked to modernize and update their reporting. Multimedia options include annotated images that help to better spell out findings and tracking tables that tabulate the progression of lesions over time. "Virtual consults and virtual rounds can integrate the radiologist as a central part of the clinical care team," he says. "It helps build a bridge of communication with the referring physician. Although NYU has multiple modes of improving radiologist interaction with referring physicians, it is important for each practice and institution to discuss what technologies fit with current workflows and work best for their radiologists and physicians." Selective word choice is another method of effectively sharing study findings and bringing a common understanding of a patient's condition to the clinical care team. Johnson suggests that radiologists should avoid using vague language that could be misleading or leave room for interpretation where more specific action should be taken. Radiologists need to be clear and direct, with actionable recommendations when possible. "An example would be when we see an incidental lung nodule, and we can tell from the medical record that the patient is a smoker," she says. "We dictate 'consider repeat CT in six months,' rather than explicitly dictating 'recommend follow-up CT chest in six months.' In choosing more vague words like 'consider,' we may be well intentioned in that we don't want to force the referring MD's hand. However, by using vague words, we probably place unreasonable expectations on referrers. I don't think we can expect all clinicians to keep up with the latest content expertise as regards what imaging findings suggest about the risk of a disease or disease progression." Clear communication among clinical staff is also vital to conveying a consistent, accurate diagnosis and treatment plan to patients. Alkasab believes there is a certain level of transparency between radiologists and providers. However, there remains debate as to whether the radiology findings should come from referring physicians or directly from radiologists. Historically, radiologists don't have ongoing relationships with their patients and also may not understand all aspects of patients' health care. In addition, radiologists are not often well trained in discussing difficult diagnoses with patients. "The communication between radiologists and health care team members should be as open as possible," Alkasab says. "The challenge is what and how to present to patients. Patients may expect to see their reports, and this is a legitimate request. However, there is some concern that you can scare patients with too much information. If patients are reading their reports, how do you make that experience easy for them and not create anxiety? It's not a problem that's been solved yet." An approach Johnson suggests is to ask the patients how they would like to have their medical information presented. In that vein, Wake Forest has established a Radiology Patient Advisory Council to seek ideas and feedback from patients. "One thing our patient advisory council has recently helped us with was drafting clear language for incidental lung nodule follow-up recommendations that offer a balance between making sure patients understand the importance of having the recommended follow-up, while not overly frightening them," she says. Alkasab points to some IT approaches that can help in the process of sharing report findings with patients. For example, radiologists who use assisted reporting tools can add a "patient-friendly" layer to the technology that helps in the management of information gathered from radiologic reports, making the language more relatable to nonclinical individuals. In addition, more radiologists are protocoling studies as a specific workflow process, even using their EHR or other external systems to maximize the value of their radiology studies. "There are tools radiologists already have, such as PACS, that have something built in that can be used to review cases and create a report or, at least, a record of the patient consultation," Alkasab says. "This can help radiologists in their communications and help them capture the time spent on patient collaborations." Alkasab, an admitted "informatics tool guy," also sees the need for better communication as a method of showing the value of radiologists in the health care spectrum. 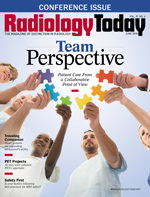 Radiologists' work product and offerings need to be perceived as high value, he says. Being a member of a clinical support team leads to credibility and the realization that radiologists do more than just read images. "If we're not talking to or listening to our colleagues—who are the people who send patients to us—how do we show our value?" he asks. "We need to work together to solve patients' problems. We need to show that we understand the patient's problem. We also need to take steps to make sure our work is aligned with the needs of the patient." Alkasab says radiologists need to move toward a world where they document everything they do beyond reading images because they need to show the value of their work, particularly in an environment where the specialty is seen as a cost center. "Radiologists need to see that, as participants in tumor boards or virtual consultations, they may not be getting paid, but they're providing value," he says. "This is important, especially as they come under payment reform scrutiny." As radiologists continue to explore best practices for sharing patient information among clinical care team members and with patients, Alkasab says it's important for them to make the commitment to finding better ways to do what they do. "We want to be as helpful as possible and build awareness of the value radiologists bring to the overall health care picture," he says.